No shooting over Easter Weekend,which was a shame as the weather has been wonderful, bright warm and dry. This enabled us to finally set the range up in the field. A complete contrast to the previous week. With the clocks changing last weekend to British summer time, it was an early start for us on Sunday as we headed north to the Wolverine club grounds not far from Stoke on Trent. Anyone who attended the shoot will agree it was wet, very wet. I think it stopped raining for about an hour over the whole day. Added to this was the strong gusts which blew in and the Somme like mud in parts. Despite the weather and mud Wolverine did their best to put on a good course. The weather had a negative effect on the archery with scores for most classes being significantly down. As for the course I thought it was overall good maybe not the best they have set as I feel there were a couple of shots that could have had arrow nets or bosses up to catch stray arrows. This would have sped the search for arrows up for many. I also think there were a couple of shots where the overshoots had not been fully considered. I don’t think they were unsafe but it is very distracting to see fellow archers collecting or searching for arrows in your peripheral vision when on the peg about to shoot. The course was the standard mixed 3d and paper faces with a couple I think slightly stretched for the size of face. Our group was made up of the two of us, John shooting crossbow and Richard shooting freestyle. Overall it wasn’t too bad a course or day despite the British weather. One entertainment feature of all the rain was watching a variety of cars trying to drive back up the entry slope. Of the several that attempted it only a couple were successful. Just to explain, Wolverine car park is in a field which you enter from a slope which tends to get quite muddy with all the traffic. Archers exit the car park from a different route, the only problem is due to the size of the car park, cars have to be parked in front of the exit, resulting in no-one leaving until the blocking cars leave. A few people decided not to stay until the end and tried to leave via the entrance slope. The rest of us waited until after the end of prize giving and left via the exit route. Neither of us shot particularly well and think it was lack of practice and conditions. Sorry there aren’t any photos of the course, but with the wet weather I had my phone buried under lots of layers to keep it dry. 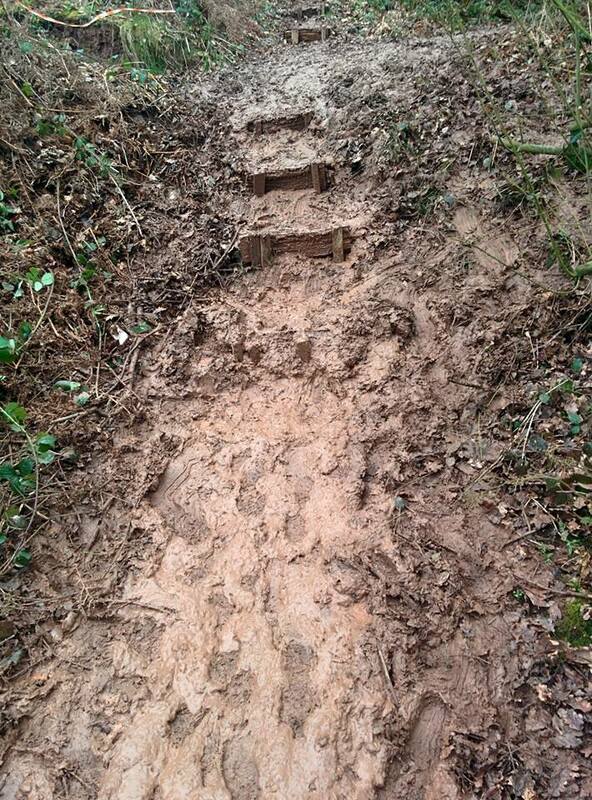 I did get a copy of a photos from a friend and fellow SVYF member showing the muddy paths. The video is a bit of fun and shows a friend of ours trying to get up the bank.